The future of the X-Men, as bleak as it looks, begins here. Uncanny X-Men #11 is a bit over-stuffed, telling the same story (Scott Summers' return from the grave and search for the missing X-Men) from three different perspectives. Cyclops gets the majority of the focus here, with Wolverine and Blind Ruth also getting several pages of back-up stories. 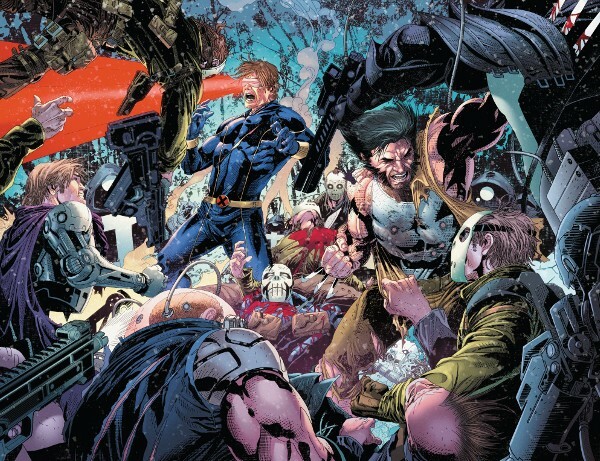 In the end, the issue delivers what you want with Cyclops standing up the Avengers (who seem more concerned with protecting a hate rally than preventing genocide) and the two most famous X-Men coming together to lay waste to large group of human canon fodder. It's a pretty bleak future which Cyclopes has returned to. Most mutants are in hiding, the X-Men are gone, and humanity has found a "cure" for the mutation they fear. As for Scott and Logan, the wait for the reunion feels a bit too strung out (although that's nothing new in comics). And, other than seeing Cable put Logan in Scott's path, I'm not sure you get much from either back-up story to justify the extra pages here (or the the absurd cover price). For fans.